As the winter rolls in, and electricity and gas prices continue to rise, now is a great time to change your habits and save yourself some money. There are many things you can do to avoid wasting energy. Also, an added benefit is that it is good for the environment too. What can you do to save money? Televisions, dvd players, computers, and many other household appliances are often left on standby for convenience. However, did you know that not properly turning off these devices can account for up to 15% of your annual electricity bill. This could be up to around £100 a year. So, if you want to stop literally losing money while you sleep, then just make an effort to turn off these devices at the wall socket. Everyone knows that having a shower instead of a bath saves a lot of water (around 70%) and can be a real money saver. However, did you know that you can fit a special shower head and make even bigger savings on your gas and water bills? The water efficient shower heads only work with showers which get a supply of water directly from the boiler/hot water tank. They can save you around £150 per year across your water and gas bills. LED technology has come a long way in the last few years, and LED lights in the home are now a viable option. They offer significant energy saving potential versus halogen lights. Also, if you still have traditional filament bulbs then you can replace these with CFLs, which are also more energy efficient. The initial cost of replacing these bulbs will take around 1.5 years to earn back in electricity bill reductions, but they are designed to last years, so you’ll be reaping the rewards from year 2 onwards. If you live in a house with a loft, then you’ve probably noticed how cold it gets up there in the winter. Just like you wear a coat to keep out the cold, you can effectively give your house a coat, by putting insulation in the loft. If you were to lay around 10 inches of insulation, you could save between £100 and £200 on your heating bill. Just by turning the temperature dial down on your washing machine from 40 to 30 degrees, you could save around £15 per year. Your clothes will still be clean and fresh, but you’ll have a bit more money in your pocket – don’t put it in the wash though! 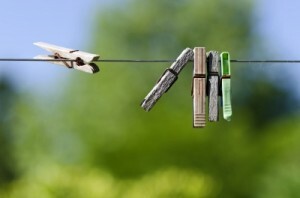 Also, rather than use a tumble drier to dry the washing, you can dry it for free by hanging it out. Having a little more patience like this could save you another £40 per year. Check out the government’s Energy Star website which has a list of the top, most efficient washing machines available today. So, there you have it, a short list of highly effective energy saving tips, which you can put in to practice straight away to bring down your bills. Can a Halogen Heater Reduce Energy Bills?